I’m often told, “You don’t look like the interpreter.” People ask me, “Where’s your Spanish from?” There’s no simple answer. As an undergrad, I took a Spanish phonetics class, which is the study of the sounds of language. On one occasion, the professor brought to class with her a hand-written traffic ticket she received while driving in the Dominican Republic. The officer who’d written the ticket misspelled just about every word. It was a fascinating specimen, the professor explained, of this regional accent, since the words had been spelled out phonetically. She actually told us that this traffic ticket was one of her linguistic treasures. A while back, I posted a sign from a local (to me) construction site that said you had to have a “sombrero duro”–very literally, a “hard hat”– to enter. This sign is from a local bar, and while I appreciate their stab at multilingualism, the Spanish is mystifyingly bad. I ran the English version thorough Google translate and a bunch of other translation apps, all of which came up with less horrible versions in Spanish. Who is coming up with this stuff? This summer I’ve taught two 40-hour Bridging the Gap interpreter trainings (whew!) 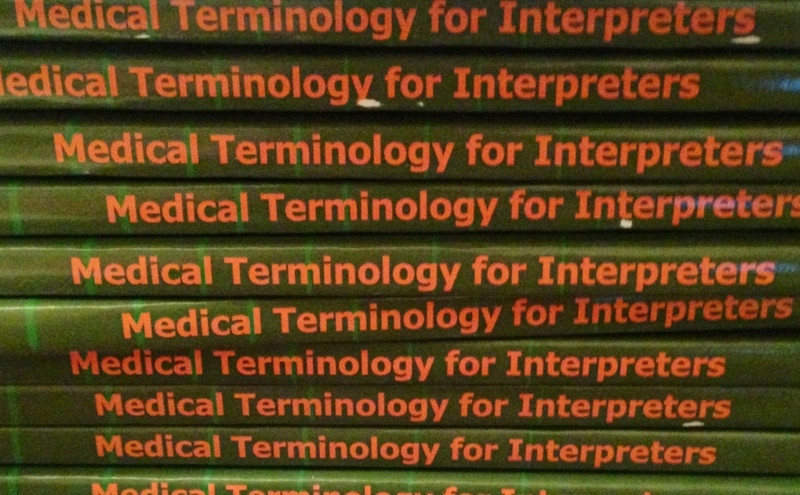 and I’m super excited to be teaching a medical terminology workshop for interpreters this Saturday! I looked at the roster today and was so happy to see names of friends, colleagues and former trainees. In the meantime, I’m working on a new post about visiting the RID conference that was in Indy last week. Hope everyone’s had a great summer!